Both a culinary spice and a medicinal herb, thyme (Thymus vulgaris) has a rather impressive nutritional content, providing great health benefits to consumers. Thyme is a rich source of vitamins A and C, two major antioxidant-vitamins with exceptional anti-inflammatory activity and beneficial action on eye and skin health and immunity. Moreover, being especially rich in iron, calcium, magnesium and manganese, thyme contributes to anemia prevention, bone, muscle and cardiovascular health and offers antioxidant protection. Thyme essential oil is a particularly efficient antiseptic agent and a natural compound extracted from it is a common active ingredient in basic care products such as toothpaste, mouthwash, hand antiseptic and some acne products or natural cremes promoting wound healing. However, it should be noted that the essential oil is only for external use and should not be ingested because the concentration of aromatic compounds in it make it hazardous for one’s health. Thyme originally grew on Mediterranean land but its natural resilience and adaptability have lead to its spread in many regions of the world. It makes a great ornamental plant as well as a low maintenance garden herb. Thyme is one of the most popular culinary herbs throughout the world. It pairs well with cheese plates, baked potatoes, roast chicken or pork steak, grilled zucchini or carrots and basically any soup, stew or simmered dish. You can also add it to vinaigrette or use it to flavor olive oil. Fresh thyme is usually sold in small branches called thyme sprigs. When spicing up your food, it is best to tie the sprigs together for easy removal later on. The herb preserves most of its flavor when dried, but fresh sprigs are far more aromatic. The trouble with the fresh herb is that is has a short life span of about a week (in the fridge). There are several popular varieties of the herb, including a lemony variety and one that has a stronger, almost oregano-like aroma. 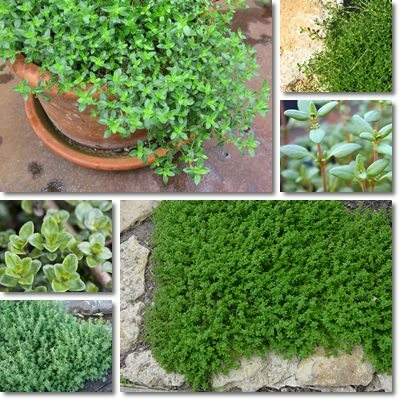 However, the most common variety is Thymus vulgaris or garden thyme. Other names include common thyme, summer thyme or English thyme. Being an aromatic herb, thyme is full of natural, flavor-giving compounds of great medicinal value. Thymol is an important phenol found in both the fresh and dried herb and its essential oil and is responsible for the unique flavor of the herb. According to research, thymol was shown to have strong antiseptic and antifungal properties, making thyme consumption highly beneficial for human health. The strong antibacterial properties of thymol have been put to use and the compound is a major active ingredient in products such as toothpaste, mouthwash, general disinfectants, hand sanitizing solutions and so on. Famous products containing thymol extracted from thyme are Vicks Vapor Rub, CVS Antiseptic Mouth Rinse and Listerine. Apparently, thymol is also a great nail fungus treatment. Other essential oils in thyme are linalool, borneol, p-cymene and geraniol. But thyme is a rich source of natural antioxidant compounds as well. Lutein, zeaxanthin (carotenoids), apigenin, naringenin, luteolin (flavonoids) are all strong antioxidants which greatly contribute to the benefits of the herb and recommend it for consumption. Lutein and zeaxanthin are two potent antioxidants and vitamin A precursors found in thyme which protect the retina against free radicals from blue light in particular and ensure good vision even at old age, reducing macular degeneration risks and improving symptoms in a pre-existent condition. Both nutrients actually accumulate in the retina and macula lutea, where they form a barrier that meets radiation and filters and absorbs it before it reaches the retina and produces any damage. As you can see from the nutrition table above, thyme is an exceptional source of vitamin A, providing 4751 IU (or 158%) of the RDA. This means eating even small amounts of thyme helps maintain healthy mucous membranes at the level of the nose, mouth, throat, lungs and digestive tract, ensuring good immunity as well as good night vision. With a high iron content (218%) thyme helps prevent fatigue, irritability, headaches and anemia as a result of a deficiency. 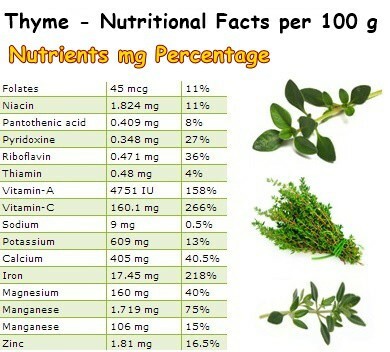 Thyme is a great culinary herb because of its incredibly high content of vitamin C: 266% of the RDA. Vitamin C not only protects against free radical damage to cells, but it also helps in the reduction of inflammation levels and in the prevention of chronic disease such as cancer, cardiovascular disease and diabetes. Increasing your vitamin C intake with the help of vitamin C-rich foods or through supplementation is great for good health. However, in order to enjoy such benefits, the herb must be consumed fresh. Drying and cooking heat will most likely lead to the herb losing all of its ascorbic acid. Thyme is a good source of manganese, a potent antioxidant-mineral. In addition to this, it contains good amounts of B vitamins, zinc, calcium, magnesium and potassium which contribute to digestive and nervous system health, good immunity, bone, muscle and cardiovascular health. Although insignificant considering how little of the herb we actually eat, even trace amounts of all of these nutrients help meet our daily demands so we can enjoy all the health benefits of a healthy, varied and balanced diet. Conclusion. As with all things, moderation is crucial so it is best to add no more than one tablespoon of thyme to a pot of steaming stew or ram one, two thyme sprigs in your to-be-roasted chicken. For more information on vitamins and minerals and the best food sources for each of these essential nutrients, please refer to the Vitamins and minerals page in the menu above.